SNMMI-TS is dedicated to the advancement of molecular and nuclear medicine technologists by providing education, advocating for the profession, and supporting research to achieve clinical excellence and optimal patient outcomes. Uptake is published six times a year by SNMMI-TS. All editorial communications should be directed to Danny Basso, CNMT, NCT, FSNMMI-TS, at (706) 774-2581 or danbasso@uh.org. As nuclear medicine technologists, we inject nearly every patient we see in the clinic. Venipuncture is a skill that is cultivated over time with experience and becomes somewhat instinctive. Although gaining IV access becomes part of the daily routine for technologists, it is important to remember the bearing it has on the outcome of test results. In addition to patient preparation, positioning, and imaging parameters, successful radiopharmaceutical administration is an important part of the clinical process. Dose extravasation compromises the final PET images in several ways: standardized uptake values will be abnormally low, reconstruction artifacts create photopenia around the injection site (which may or may not be in the field of view), 3D image reconstructions are often unreadable, and extravasated tracer can travel through the lymphatic system, causing uptake in lymph nodes, which can be confused with cancer. The following case studies address the efforts of two institutions that used a radiation sensor device, (Lara™, Lucerno Dynamics) to identify and address dose extravasation, thus improving overall patient care and outcome. Figure 1. 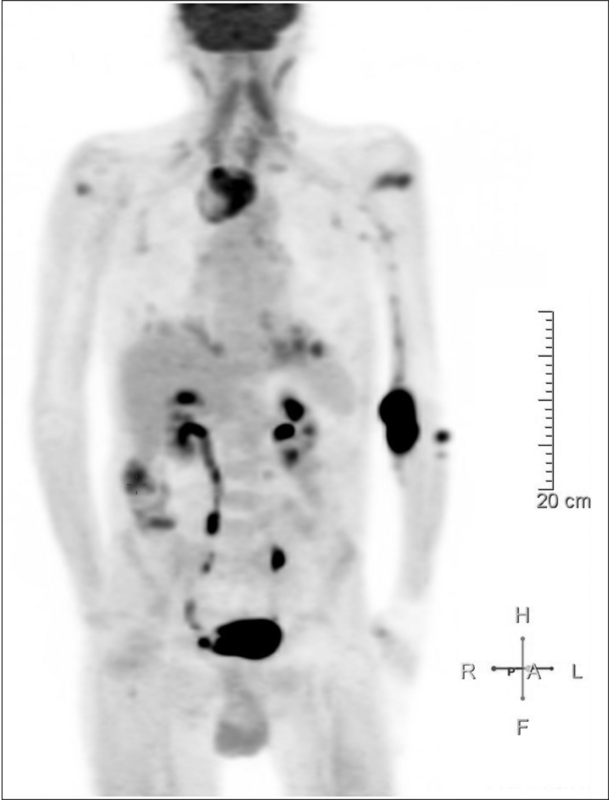 PET/CT scan with dose infiltration. Figure 2. Dose infiltration and corresponding time/activity curve. In our PET/CT department, we embarked on a quality improvement project to decrease the number of PET radiotracer extravasations. We sought to evaluate the root causes of extravasation of radiotracer by analyzing: injection site/side, needle equipment, injecting technologist, image quality review and time-activity curve analysis of the quality of the injection. We used a radiation sensor on each arm to measure the amount of radioactivity at each location after the injection. Data collected during the uptake period reveal normal distribution of the radiotracer versus mild, moderate or severe dose infiltration. 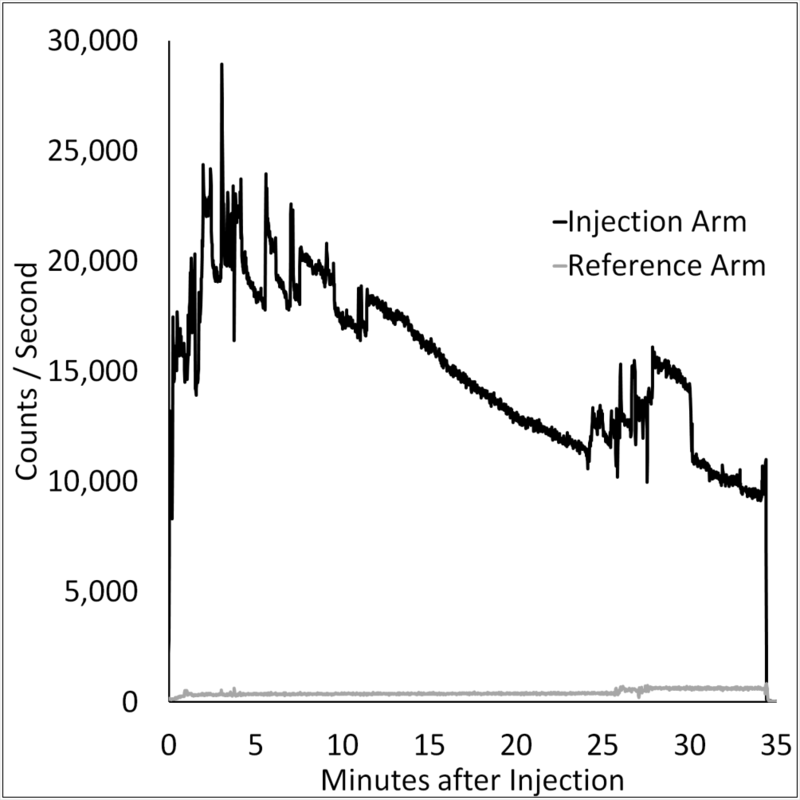 A report displaying an activity curve is promptly generated giving the technologist, and ultimately the radiologist, awareness of the injection quality. Figure 1 is an example of a PET/CT scan with a dose infiltration and corresponding time/activity curve (Figure 2) produced by the radiation sensor device. Equipment selection: Butterfly devices are subject to becoming displaced due to patient movement and therefore yielded more infiltrations. Angiocatheter injection is less likely to infiltrate due to secured placement and inability of the tube to puncture the vein after needle removal. Using a "favorite" site for injection: We found that technologists who attempted injection at the same site each time had higher infiltration rates. Although the injection room may encourage a particular arm, or a dominant hand may make one site more comfortable for the technologist, it is worth the time and effort to select the largest vein. The vein should also be straight and should not move under the skin. Data showed clearly that the technologists who sought the best vein were less likely to infiltrate the dose. Failure to thoroughly test the angiocatheter to ensure patency: Methods that facilitate a good injection include drawing blood back into the catheter, adequately flushing with saline, observing the injection site for fluid under the skin and querying the patient regarding pain or burning sensation at the injection site. Our experience enabled us to produce a training video to support process improvements and emphasize existing successful techniques. The video has become part of standardized training for existing staff, new employee orientation and student technologist enrichment. In addition, we used reports generated by the radiation sensor manufacturer to facilitate evaluation of technologist’s tendencies with regard to venipuncture site, side, gauge and IV type. Although experience is an important asset when performing any skill, ineffective habits may contribute to inferior results. Feedback enabled technologists to be made aware of areas for improvement in imaging and patient care based on actual data. Using these data at Wake Forest Baptist Health, we have reduced our infiltration rates by almost half. Although this improvement was applied only to our PET/CT patients to date, it is a significant quality advancement. The Carilion Clinic PET/CT department embarked on a process improvement project that encompassed technologist injection accuracy and subsequent imaging impact. We used a radiation sensor device that records and renders a visual graph, illustrating quantitative data about the injection and incubation period. We began our journey by collecting injection data for 13 weeks, making no changes to our injection process for the 83 patients injected during that timeframe. At the end of our first tracking period, our patient care team met with the company’s technical support team to discuss findings. By comparison with other sites utilizing a similar method of data collection, we were on the higher end of median percentages, with an infiltration rate of 15.7%. Results further revealed that we each had definitive areas of weakness. As patient height/weight decreased, the probability of infiltration increased. Graphs showing data for 8 of 20 patients weighing less than 145 pounds illustrated moderate infiltrations. In addition, data highlighted problems in the elderly patient group: patients over 70 years of age were more likely to sustain less-than-desirable injection results when a butterfly was used to attain venous access and the radiotracer was administered in the right antecubital. We entered a second collection period with a concrete plan to decrease our infiltration rate, increase image quality and positively impact patient outcome. We spent a couple of days discussing our action items, which included injections via angiocatheter, as opposed to butterfly, in patients over 70 years old and those weighing less than 145 pounds; left instead of right arm injections in the elderly; and standardizing our postinjection saline flush process. Since our department is a mobile facility, we preferred to flush with 10 ml saline for a mental count of 15—rather than hanging a 50 ml bag as some facilities have done—to minimize early termination of data collection due to urgent restroom needs. Our second acquisition period consisted of approximately 20 weeks, including 83 injections. Upon completion of the period, we found that our infiltration rate had decreased to 6%. In a third collection period, data revealed continued improvement, dropping our infiltration from 6% to 3.3%. Thus, across all three periods, we were able to decrease our overall injection infiltration rate by 78.9%. We continue to collect and track injection data and look for patterns to improve. Dose extravasation in PET/CT has the potential of reducing image quality and affecting accurate SUV quantification. These case studies demonstrate how the ability to accurately identify, measure and implement a process improvement program to reduce dose extravasations can ultimately have a positive impact on patient outcomes in PET/CT. It has been a busy year, with lots of new member benefits added. On the continuing education (CE) front, our goal is to make your job (and your life) just a little easier! SNMMI-TS members will now automatically have free CE activities offered as part of the member benefits appearing on the “My Activities” page in the Learning Center. Automatic enrollment in these activities allows easy access to complete CE credits. 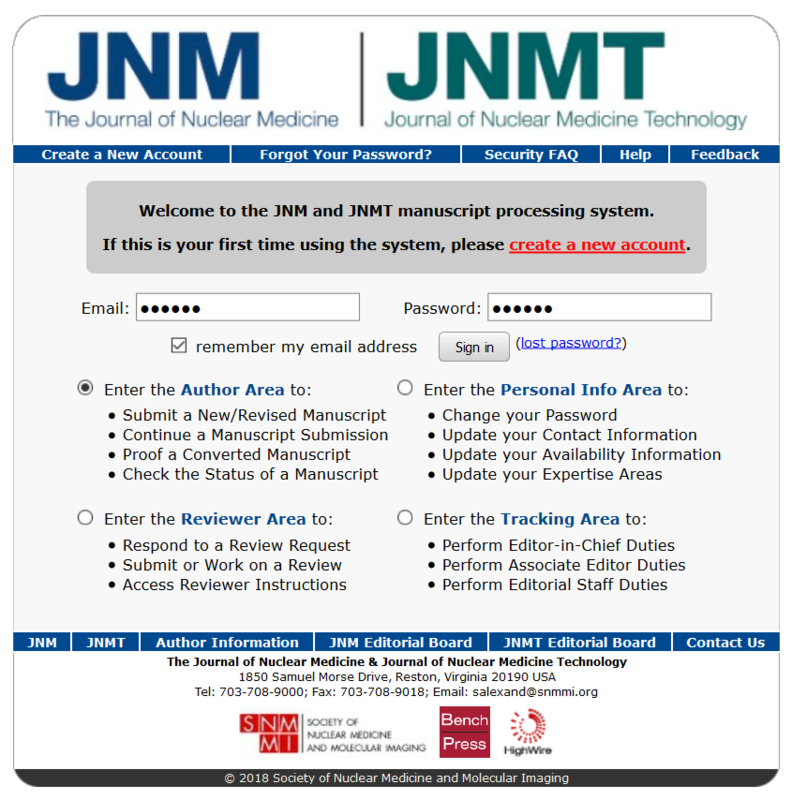 Several Journal of Nuclear Medicine Technology (JNMT) articles are already available. When you renew your membership with SNMMI, you'll never miss a CE opportunity again! JNMT, under the leadership of Kathy Thomas, MHA, CNMT, PET, FSNMMI-TS, has many new features in addition to the new red and white cover. They include invited editorials, an educators’ forum, practical protocol tips, sections on professional development, quality and practice management, and radiopharmacy and adjunctive medications. In addition, the JNMT Twitter Club (@JNMTClub), which launched April 19, provides a forum for discussion of a JNMT article—which is also available for CE credit (free to members). So, how does it work? First, you must have a Twitter account and sign in. 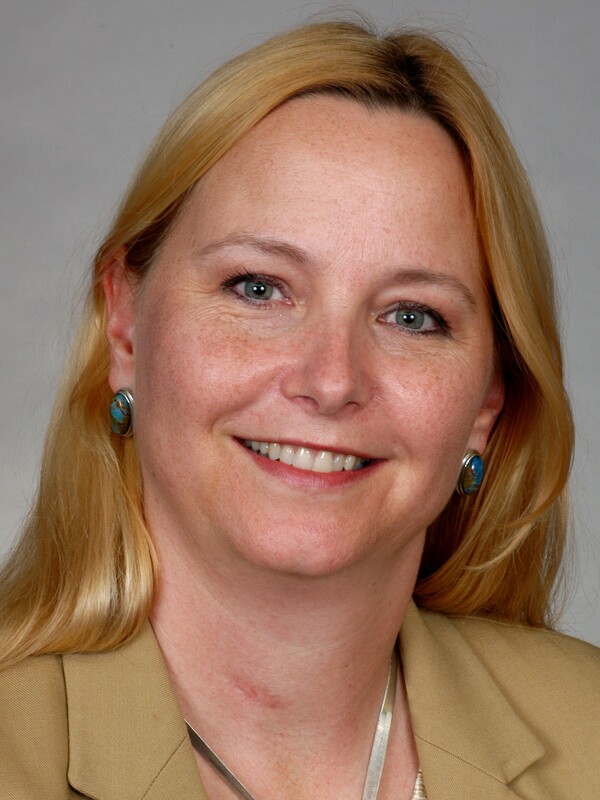 For those new to Twitter, Mary Beth Farrell, MS, CNMT, NCT, FSNMMI-TS, has made a couple of YouTube tutorials to help you get started: Short Twitter Tutorial (5 minutes); Longer Twitter Tutorial (8 minutes). Then follow @JNMTClub on Twitter. For the discussion, go to @JNMTClub and participate by including #JNMTclub in every tweet you write. The Club provides an opportunity for differing perspectives to be “heard”—in 280 characters or less (but tweet as many times as needed to express your view). Everyone is invited—from students to technologists working in any setting! SNMMI has made accessing the Career Center easier with a new single sign-on. Members are also now able to access the career center as soon as they log into to the SNMMI website; no separate login is required. Career Center account benefits include career coaching, résumé writing and reference checking. Plus, the Career Learning Center provides video and written tips on topics from résumé writing to developing a personal network for career success. The career center is also adding a new section dedicated to “in-training” members. The in-training section will allow employers to post resident, fellowship, student and general in-training jobs on the site for free. In addition, in-training members will be able to post résumés to both the general SNMMI Career Center and the in-training site, providing additional exposure with employers. A new Mentor Platform is in development. It will provide a forum for new and emerging leaders to connect with mentors in the field. Mentees will be able to go into the portal and search for mentors that meet their criteria. Once the system has found a match, an e-mail will be sent to the mentor requesting the connection. The two may then start communicating in an official mentor/mentee relationship (after confirming they are a good match). SNMMI is currently building the mentor list and setting up guidelines that mentors and mentees must follow to ensure a successful process. Stay tuned! I’m excited to report that SNMMI will launch a new community platform this summer. Through a partnership with Higher Logic, SNMMI Connect will bring together colleagues from around the world via an online e-community. It will have discussion forums for a wide range of interest areas and groups—facilitating collaboration and the sharing ideas and information. The SNMMI Annual Meeting is just around the corner. 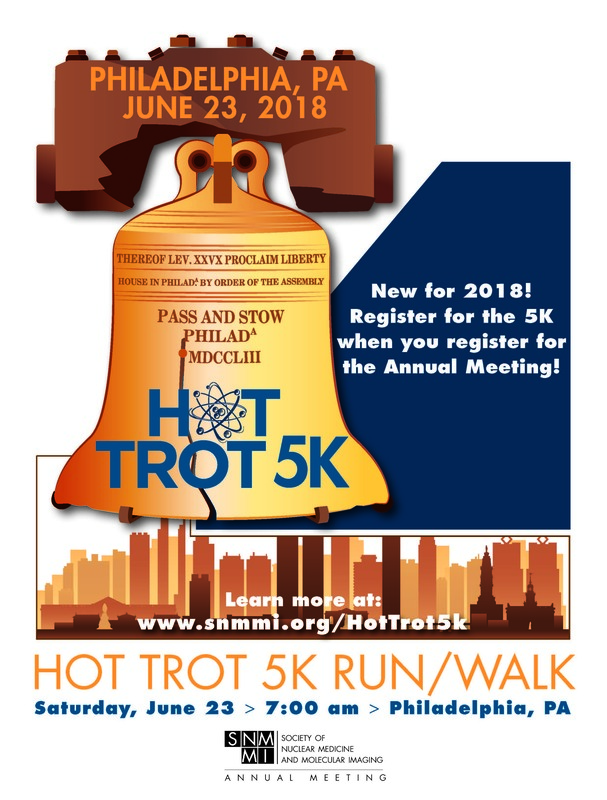 From the new Welcome Reception and nuts-and-bolt sessions to presentations on innovative research advances and the ever-popular Hot Trot Race/Walk, this year’s meeting promises to be better than ever. I look forward to seeing everyone in Philadelphia June 23-26! As nuclear medicine and molecular imaging continue to expand and advance, new opportunities and career pathways emerge for technologists. However, this also means that new educational needs exist. Many times, these new opportunities and career pathways require additional education. Therefore, it is imperative that the educational sector of our field continue to support technologists in this regard. This year has already brought a myriad of educational updates and opportunities for technologists to refresh the basics, stay abreast to emerging technologies and advance their career. For technologists who earned ARRT credentials after January 1, 2011, the window has opened as of January 1, 2018, for continuing qualification requirements (CQR). The CQR process is free, although it is required to maintain ARRT credentials (1). The process includes three parts: the professional profile, a structured self-assessment, and prescribed CE if needed to address any areas for improvement. Prescribed CQR continuing education will count for CE credits toward your ARRT biennium requirements. The SNMMI-TS has many CE offerings that can fulfill the CQR prescribed CE requirements and is currently working hard to create clinical refreshers to assist technologists in these ARRT requirements. The clinical refreshers will be available through the SNMMI website beginning in the summer. The next administration of the NMTCB Radiation Safety exam is scheduled for August 17, 2018 (3). The application deadline for the 2018 exam is July 1, 2018. To be eligible for the exam, you must have an active nuclear medicine certification with a minimum of two years of experience and documented experience performing tasks directly associated with radiation safety for at least one year. Technologists interested in applying should refer to the Radiation Safety Certification Exam page on the NMTCB website (3). The NMTCB does accept some additional certifications for 24 CE credits. Technologists who are preparing to earn additional certifications should contact the appropriate certification agency for questions regarding CE credits for exam preparation or successful completion in advance to assure compliance. One goal of the SNMMI-TS is to be the leader in education and professional development for technologists (4). A key objective within that goal is to review the entry-level curriculum guide annually to remain current with emerging technologies and new changes to our field. With consideration to the recent steady growth in PET/MR, a task force was created at the Mid-Winter Meeting to determine whether, and to what extent, MRI should be included in the SNMMI-TS Entry-Level Curriculum Guide. The Educator’s Committee will hold an Educator’s Forum again this year at the SNMMI Annual Meeting. The Educator’s Forum offers several CE sessions centered on education topics, including global nuclear medicine education and flipped classrooms as well as updates from the Joint Review Committee on Educational Programs in Nuclear Medicine Technology (JRCNMT), the ARRT and the NMTCB. The Educator’s Forum is open to anyone interested in education. The Educator’s Committee is also collaborating with the JNMT to offer an area in the journal dedicated specifically to educators and education-related topics. As nuclear medicine continues to evolve at a fast pace, the SNMMI continues to find new ways to support technologists through education. The Continuing Education Committee has many programs available for a variety of needs. For example, the CT+ Review and Essentials Program offers 17 credits of structured education to help technologists prepare for CT certification through the ARRT or the NMTCB. Similarly, the Radiation Safety+ Review and Essentials Program offers 7.75 credits of CE for technologists preparing for the NMTCB (RS) exam. Each program includes CE questions at the end of each module, as well as a mock exam. Although these programs were created to assist technologists seeking a secondary certification, they are available for anyone to purchase for CE credit. The CE Committee is also launching several new CE programs this year. In addition to the ARRT clinical refreshers and content to satisfy CQR requirements, the committee is putting together a webinar series for 2018 that will include new PET tracers and therapy agents. Don’t forget to attend the JNMT Twitter Journal Club for CE credit. If you are interested, follow the JNMT Twitter Club at @JNMTclub and refer to the SNMMI website and SmartBrief for more information. To participate, use the #JNMTclub during the session for all tweets and replies. “What Are Continuing Qualifications Requirements?” CQR Overview, www.arrt.org/CQR. “ARRT Continuing Education Requirements.” ARRT, 1 Sept. 2017, www.arrt.org/docs/default-source/Governing-Documents/continuing-education-requirements.pdf?sfvrsn=18. “Radiation Safety Exam Application.” Radiation Safety Exam Application | Nuclear Medicine Technology Certification Board, www.nmtcb.org/specialty/radiation-safety-application.php. “Strategic Plans.” Strategic Plans - SNMMI, SNMMI, http://snmmi.files.cms-plus.com/FileDownloads/SNMMI-TS_Strategic_Plan_FINAL_11012017.pdf. When you’re acknowledging a 50-year milestone, you pull out all the stops. Planning for a 50th wedding anniversary, a 50th birthday or retirement after 50 years on the job takes considerable time and thought—each event signifies a lifetime of accomplishment, survival and existence. All are usually celebrated with a bang! Toasts are given, memories of the “Good Old Days” are shared, and tears are spilled over those no longer present. A shared history is what connects everyone at each celebration. Something HUGE is on the horizon! Time, thoughts and resources are building up to June 2020: The Society of Nuclear Medicine and Molecular Imaging Technologist Section (SNMMI-TS) will commemorate its 50th anniversary during the SNMMI Annual Meeting in 2020! Just think about that for a second. As an organization, we have traveled alongside our physician, physicist and pharmacist partners—who have also served as our mentors and supporters—for 50 years to reach the 21st century. From our creation, we aspired to become something great. We wanted to be more than just the “technician” of our birth. With the establishment of key certification boards and the requirement for licensure in several states, we became “technologists.” However, as many in our ranks layer on educational degrees beyond the associate’s to the bachelor’s, master’s and PhD, who can predict where our professional march will lead us? Is there a “keeper” of our shared history? Originally, the SNMMI-TS secretary was also the historian for the Section. Over time, this connection changed, and the historian position and its related duties went silent. However, in spring 2015, SNMMI-TS Past President Aaron Scott, NMAA, FSNMMI-TS, reestablished the History Committee to drive activities for the 50th anniversary. The History Committee has been charged with chronicling the rich and remarkable history of the Technologist Section, presenting that history to our members, reminding our members where we were and what we have accomplished, celebrating our longevity and documenting our path toward a bright future. Once formed, the Committee members got right to work. An ambitious timeline was created to emphasize major events in the SNMMI-TS history. 2015: The Paul Cole Scholarship Fund in conjunction with the Education and Research Fund (ERF). The goal here was to provide to our members a glimpse of WHO Paul Cole was and WHY it is important to contribute to the Paul Cole Scholarship Fund. 2016: SNMMI-TS past presidents posters with quotes displayed throughout the conference center at the Annual Meeting. These posters served to put a face to the SNMMI-TS presidents and “hear” their voices. 2017: Celebration of the 10th year anniversary of the SNMMI-TS Leadership Academy. The academy was established to continue the Section’s legacy of dynamic leaders. Our future is in motivated and dedicated hands. 2018: A continuing education session will be presented, “Focus on Licensure, Professional Status, Affiliated Professional Organizations.” The objective is to allow the certification boards to share their historical affiliation with the Section. Advocacy and our future professional status will be discussed in this series also. 2019: “Hearing from The Chapters” will provide historical contributions. Our 13 chapters get to shine by presenting their early days, key accomplishments, current leadership and goals for the future. The National Council representative for each chapter will be provided a template for entering information about the chapter. PICTURES are most welcome! 2020: Celebration of the 50th Anniversary of the SNMMI-TS! This will be a GOLDEN Event! Plan on attending this historic Annual Meeting to witness up front and personal a new chapter in our shared history. The SNMMI-TS History Committee—with the assistance of the Education and Research Foundation for Nuclear Medicine and Molecular Imaging, the SNMMI History Committee, our affiliated professional organizations and our wonderful SNMMI staff—has accomplished a great deal to date … all leading up to the Grand Celebration of 2020! In 2020 the committee will present the SNMMI-TS membership with a compilation of its history through a narrative and pictorial accounting. Hard copy of this publication will be limited; however, a digital version will be available on the SNMMI website. More to come on this as we get closer to our 50th. Do you remember when you joined the “SNM Technologists Section”? Did you know about the pioneers who had gone before you and probably were still working with you? We have seen unbelievable changes in the healthcare industry and the world around us. Let’s bring back those moments and share them with each other as we head toward this monumental event. Your membership in the SNMMI-TS grants you the privilege of being a contributor to its history— past, present and future. Soon you may be called upon to share your personal contribution to the pending commemoration. Share Your Expertise: Become a JNMT Reviewer! It’s easy and professionally rewarding! Step 2: Email JNMT Editor Kathy Thomas at ksthomas0412@msn.com to confirm that you’ve created an account and are excited about reviewing submitted manuscripts in your areas of expertise! For questions or assistance in setting up your account, please contact Kathy Thomas. The SNMMI-TS would like to introduce a new committee, Women in Nuclear Medicine (WINM-TS), founded after the successful implementation of the WINM physician group. The committee plans to create mentoring groups for new technologists, present a continuing education (CE) session at the SNMMI Annual Meeting each year with women in mind, and reach out to women technologists through social media. 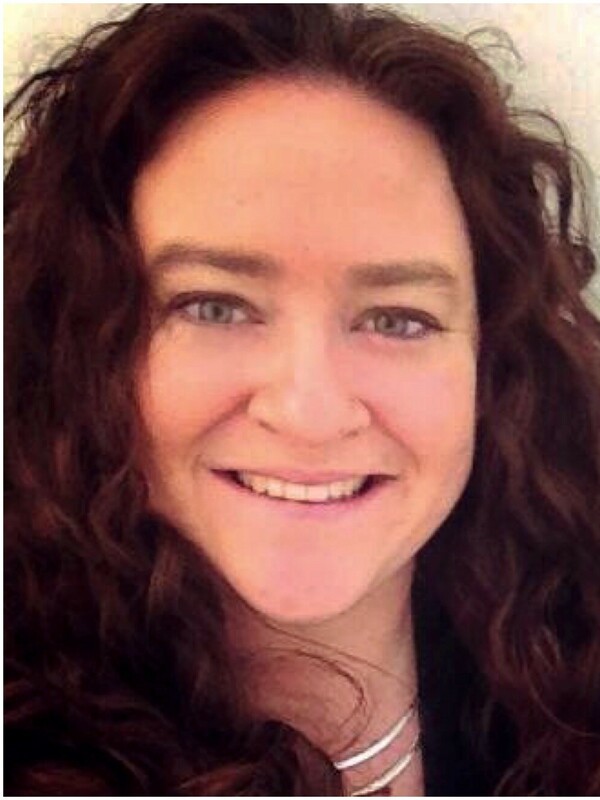 If you are interested in being a mentor/mentee, please send an email to Michelle Ewing at mewing@snmmi.org with your name, title, affiliation and areas of interest. The WINM-TS would like to feature women technologists who have received awards in the past year, women who have published or presented, and women who have served at a leadership level in the SNMMI-TS. 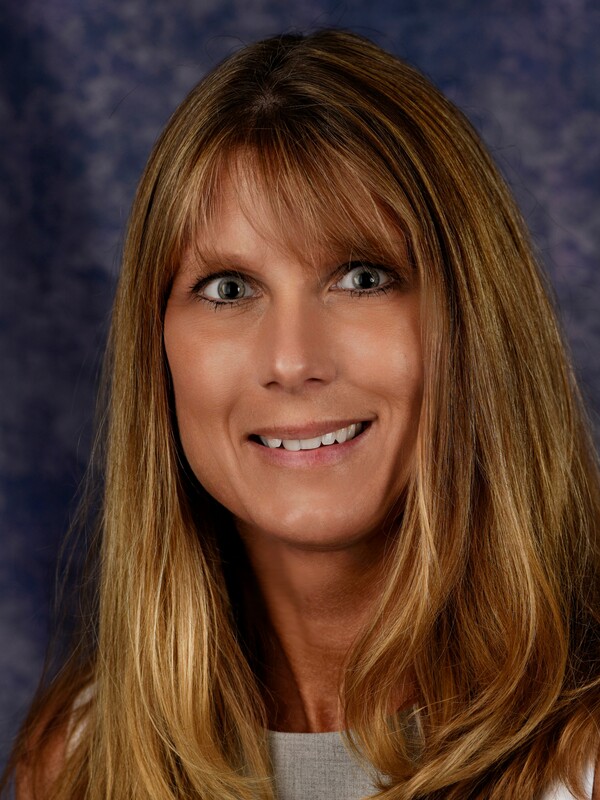 If you would like to be featured, please send a photo and information for the caption including your name, title, hospital/organization name and achievement to Michelle Ewing. This information may be shared on the WINM Facebook and Instagram page. The first WINM-sponsored CE session will be held at this year’s Annual Meeting in Philadelphia on Monday, June 25, from 3:00–4:30 pm. The session will include presentations on work-life balance, moving into a leadership/management position and radiation safety with declared pregnant workers. I hope you will plan to join us at our first session. I am very excited about this new committee, and I encourage other technologists to consider serving on this team of technologists. The committee currently comprises three working groups: the Program Working Group, the Mentor Working Group and the Social Media Working Group. Over the last few years, the Nuclear Regulatory Commission (NRC) has been methodically compiling and analyzing I-131 therapy information to determine whether the existing I-131 therapy patient release criteria need revising. They recently released two documents: Summary of Patient Release after Radioiodine Therapy Research Review and a Policy Issue (Information) of the Staff Evaluation of the U.S. Nuclear Regulatory Commission’s Program Regulating Patient Release After Radioisotope Therapy. What are the takeaways for nuclear medicine technologists at this time? We learned new information and validated what we already knew. revise 1997’s Regulatory Guide 8.39 Release of Patients Administered Radioactive Material leading into NUREG-1556, Volume 9 Consolidated Guidance about Materials Licenses: Program-Specific Guidance About Medical Use Licenses. Thyrotoxicosis patients metabolize I-131 differently than thyroid cancer patients. As a result, NRC staff determined that treated thyrotoxicosis patients could be potentially threatening in only one release scenario using public transportation, while treated thyroid cancer patients posed a hazard in all public transportation scenarios. What nuclear medicine technologists already knew is that patient behavior is unpredictable. NRC staff determined this fact as the leading factor in determining public exposure from a post–I-131 therapy patient. This means that while we educate the patient, have them sign that they understand the education and provide them with informative pamphlets, they will still do what they want to do. NRC staff hope to be able to provide treating institutions the best possible information in order to help them determine all possibilities for cumulative radiation exposure to patients’ family members and the public. The Spring chapter meeting season is drawing to a close, and soon it will be time for SNMMI’s Annual Meeting in Philadelphia! First, a reminder: if you attended a meeting hosted by a chapter or affiliated organization this fall, be sure to log into the SNMMI Learning Center at www.snmmilearningcenter.org and click on “My Activities” to complete your evaluation and receive your continuing education (CE) credits. Credit data are available within 2–3 weeks of the program; look for an email from Education@snmmi.org, which will let you know when the credits are ready. If you have questions, please contact the Education Department staff. Another great live educational opportunity is the upcoming SNMMI 2018 Annual Meeting on June 23-26 in Philadelphia, PA. You can earn up to 25 credit hours by attending your choice of 195 CE and scientific sessions on a variety of topics, including: cardiovascular, neurosciences, oncology, therapy, instrumentation, pediatrics, anatomic imaging, general clinical specialties, molecular targeting probes, radiation safety, response criteria, career development, and other emerging topics in nuclear medicine. Visit www.snmmi.org/AM for more details. This program was designed to provide a refresher on key concepts necessary in nuclear medicine technology. The 9-credit program includes five individual modules: Radiation Safety, Radiopharmacy, Pharmacology, Quality Assurance: Imaging Instrumentation, and Quality Assurance: Non-Imaging Instrumentation. These modules will be available for purchase either individually or as a bundle. The program also includes a sample competency checklist that can be modified to meet specific competency requirements of individual clinical sites or hospitals. Authors of this program include: Kathy Thomas, MHA, CNMT, PET; Geoffrey Currie, MBA, PhD, CNMT; Sara G. Johnson, MBA, CNMT, NCT, FSNMMI-TS; Sara L. Johnson, CNMT, RT(N)(CT)ARRT; and Michele A. Panichi-Egberts, CNMT, RT(N), FSNMMI-TS. This second “mini-book” in the SNMMI-TS Quality and Safety Series focuses on abdominal imaging procedures performed in nuclear medicine, including imaging rationale, indications, patient preparation and education, imaging procedure, and more. The digital book is free to members; CE credit access is now available for purchase. For more information on the above and other programs, please go to the SNMMI Learning Center at www.snmmilearningcenter.org. Click on “Technologist-VOICE” to see a list of programs that are available. The Continuing Education Committee continues to look for educational offerings that can help technologists advance in the profession as well as remain current in the basic skills and technology associated with nuclear medicine and molecular imaging. If you have ideas or suggestions, please contact Co-Chairs April Mann, MBA, CNMT, NCT, RT(N), or Sara L. Johnson, CNMT, RT(N)(CT)ARRT. TS29: Pediatric Imaging—What Aren’t You Doing? This $5,000 scholarship supports a student who is employed as a technologist and is actively pursuing an advanced degree related to his/her nuclear medicine career. This $2,500 scholarship supports students of color pursuing a two- or four-year degree in nuclear medicine. This scholarship honors the memory of Mickey Williams, a past SNMMI-TS president who immigrated to the United States from Jamaica. 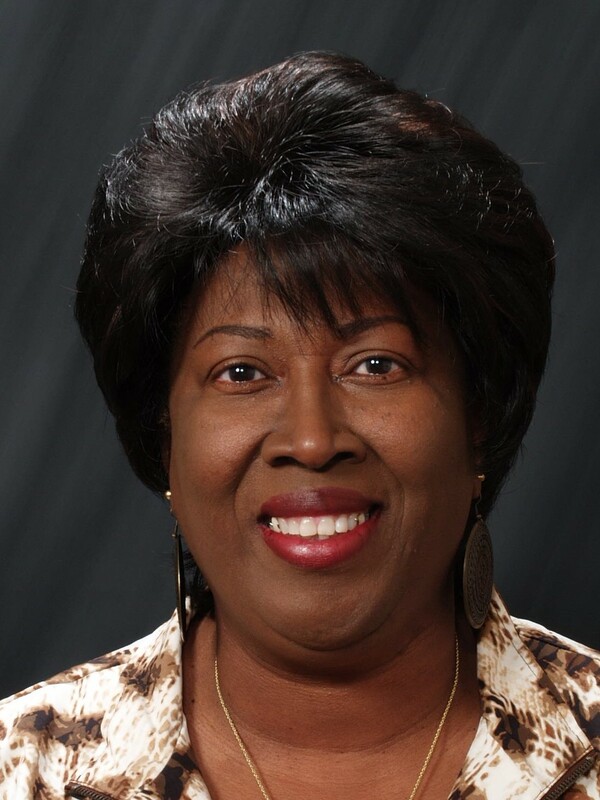 In honor of Susan C. Weiss, SNMMI-TS past president and former executive director of the Education and Research Foundation for SNMMI, the Susan C. Weiss Clinical Advancement Scholarship for $500 supports a Certified Nuclear Medicine Technologist who is pursuing clinical advancement through a didactic educational program. 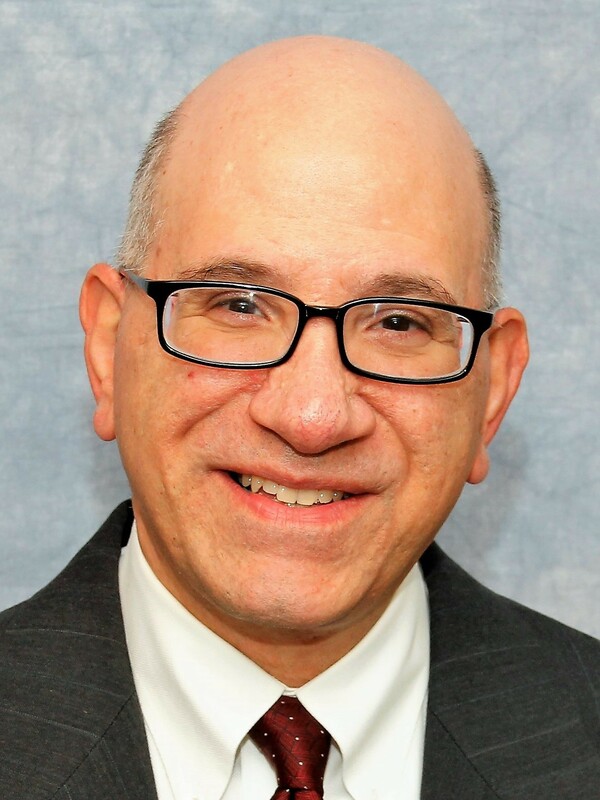 Danny Basso has chaired the SNMMI-TS Publications Committee and the Uptake Editorial Board for the past 5 years. In that time, he initiated publishing of the Quality, Safety, & Dose Optimization book series, which is an amazing member benefit; started and helped develop the Quick-Reference Protocol Manual for Nuclear Medicine Technologists; and oversaw revisions of the a number of successful SNMMI-TS books. He oversaw the Journal of Nuclear Medicine Technology and conducted the search for the new editor. Danny moved Uptake to digital format and then oversaw its successful conversion to a new, interactive HTML format. He guided development and production of thirty issues of Uptake. His vision has made Uptake into what it is today. He will soon pass the reins to the new chair, but before that happens we want to thank him for his service and for all that he has done not just for publications but for the field of nuclear medicine and molecular imaging.